Fall is upon us, and so are the unforgettable colors that come with it. 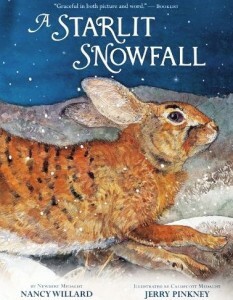 That’s why A Starlit Snowfall, by Nancy Willard, is such an appropriate book for fall. It’s full of the warm, earth-toned colors of red and brown and fading green that help us usher in the fall. With this sage bit of poetic wisdom, the bear invites the little rabbit to snuggle close and share his den until the harsh winter has passed. At first the rabbit refuses; the hills and valleys and woods are just too tempting for its little bunny feet. But after a wolf threatens, the little rabbit retires to the den and tries to sleep as soundly as the bear. Unfortunately, sleeping through winter is just not what rabbits do. Like that other little bunny that “just keeps going and going,” this little rabbit can’t lie still for too long. It zips out of the den, leaps through the brush and frolics through the forest to its hearts content. This is a beautiful book about nature, personalities and unlikely friendships. The text is cute, age-appropriate and “quiet,” despite the conversations that occur between the bear and the rabbit. The illustrations (by Caldecott Medalist Jerry Pinkney) are warm and familiar, and take readers on a colorfully adventurous journey from early fall through the snows of winter. If you love books about nature and natural friendships, be sure to read A Starlit Snowfall. It’s as appropriate for an elementary classroom reading assignment as it is for a laptime favorite just before bedtime. Best wishes and happy fall! Next articleOh, What a Christmas!